This tour acquaints with the breathtaking Solovki Archipelago situated in the cold White Sea. You will visit the Solovetsky Monastery and the exhibition, devoted to the history of GULAG, see the labyrinths of the Stone Age on Zayatsky Island and the highest point of Solovki to enjoy the scenic panorama. Solovki Grand Tour was specially created for travelers, who want to combine St. Petersburg with some special area of Russia. Just a night by train and you will plunge into a special atmosphere of the Russian North and visit one of the most mysterious places of Russia with a very tragic history. 10:55 Arrival at Kem. Meeting with the guide. Transfer to the railway station. 12:30 Departure for Solovki by slow boat. 14:30 Transfer to the hotel. Accommodation. Lunch. 16:00 Excursion around the Monastery complex. 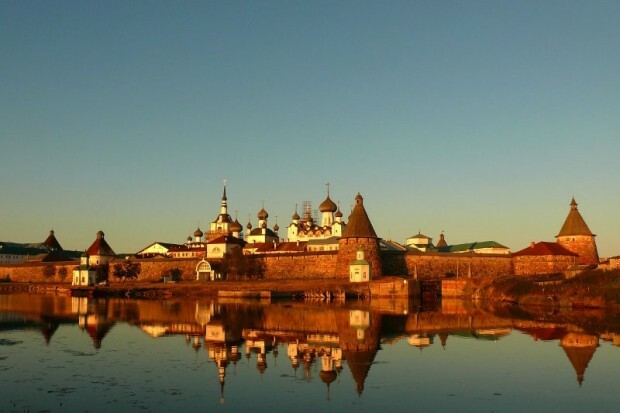 You will listen to the history of the legendary Solovetsky Monastery that once was one of the richest monasteries of Russia, visit its functioning church, and go along its thick fortress walls that no enemy could overcome. 10:00 Today you will visit the highest point of Big Solovki Island, Hill Sekirnaya. On the top of the hill is situated one of the strictest sketes of the island with a unique lighthouse church. During the GULAG time the skete was one of the cruelest of all the detention places for the inmates of the camp. Today it is a living skete again; a very tranquil place that offers a fantastic panorama view over the island. 13:30 Lunch after the end of the excursion. 15:00 Free time. * For additional pay Boat excursion to Island Zayatsky. Stone labyrinths of Big Zayatsky Island are rare and valuable archaeological monuments. You will have a chance to observe the impressive monuments of the past and admire a special beauty of this small island. Climate here is so severe that the island is covered mostly with a variety of moss species and berries. 18:30 Return to the hotel. Free time. 10:00 Excursion to the exposition devoted to the history of the Solovetsky Labor Camp (GULAG). 12:00 Lunch. Free time on Big Solovetsky Island. 16:00 Transfer to Kem by slow boat. 19:00 Dinner. Transfer to the railway station. 20:25 Departure for St. Petersburg. accommodation based on twin room sharing at Solovetskya Sloboda Hotel, FB, transfers and excursions according to the program, English-speaking guide.